Update 20 July 2016: This campaign was successful. The Statutory Instruments implemented today in England and Wales today make Improvement Notices legally binding. See our press release for details. Scotland’s Statutory Instrument also makes certain provisions legally binding, but does not provide for warnings through Statutory Instruments. Are you tired of reporting illegal formula marketing in the UK and seeing no prosecutions brought against the law breakers by the responsible authorities? Even for repeat offenses? Are you concerned that the Department of Health is proposing to decriminalise certain marketing requirements, rather than enforce them? And that it aims to give companies more time to comply with regulations they have been breaking for years? That this House is concerned that the provisions of the Infant Formula and Follow-on Formula Regulations 2007 are disrespected in the UK, as evidenced by the current promotion for Nestlé SMA infant formula by Tesco in breach of Article 23 of that regulation, the near identical labelling of infant and follow-on formula to make them cross-promotional in breach of Article 19 of that regulation, the widespread advertising of infant formula brand names and logos in breach of Article 21 of that regulation and the use of idealising text and images on labels in breach of Article 17 of that regulation; therefore rejects the Department of Health’s proposals to decriminalise certain of those requirements, such as labelling provisions in planned draft legislative proposals, related to EU Regulation 609/2015 which will replace these 2007 regulations; and stresses that any move to a system of Improvement Notices must have the purpose of speeding up compliance and be backed by prosecutions rather than giving companies who have flouted the law for many years additional time to comply. It is best to write your own message, perhaps sharing your experiences of the law being broken. Include the request to sign EDM 1189. You might like to suggest your MP attends the Infant Feeding and Inequalities APPG as well. Donate to help Baby Milk Action work on this and other campaigns to protect infant health and right of mothers to accurate, independent information on infant feeding. (Think of it as buying Baby Milk Action a coffee – but send us the money instead to help fund our work). Here is further background information on the issues raised in EDM 1189. Tesco is currently promoting Nestle SMA infant formula across its chain in breach of Article 23 of the Infant Formula and Follow-on Formula Regulations (2007). This prohibits special displays, price discounts and any other promotional activity to induce the sale of an infant formula. Tesco is doing all of these to clear stocks of Nestle SMA infant formula because Nestle is launching a new product called SMA PRO as it says babies fed on the current formula have “protein intake in excess of requirements”. Click here for further examples of Tesco promotions and more details of Nestlé’s marketing strategy for its new formula. 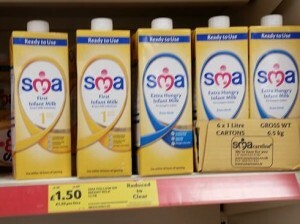 Tesco ran a similar illegal promotion for SMA infant formula in 2015 and 2009. Despite being a repeat offender it has never been prosecuted. In this latest case, Tesco’s legal officer told Baby Milk Action (1 March – over a week after we contacted her): “I am investigating with our Customer Engagement Centre.” In 2015 the Legal Officer said promotions would be removed, but they were still being installed 3 weeks later. In other words, the Trading Standards authority that receives reports of offenses from offices around the country cannot take legal action. Only the authority local to one of the supermarkets is permitted to do so – but none do because for them it is just one offense and they have many other local issues to deal with. No Trading Standards office has taken it on themselves to prosecute a retailer for illegal practices since regulations were first introduced in 1995. Click here to report illegal promotion to Baby Milk Action and your local Trading Standards office. There shall be no point-of-sale advertising, giving of samples or any other promotional device to induce sales of infant formula directly to the consumer at the retail level, such as special displays, discount coupons, premiums, special sales, loss-leaders and tie-in sales. The 1995 Regulations had a similar provision. Yet throughout this time companies have launched products with near-identical labelling to make products cross promotional. As in the examples below of Danone and Nestle product ranges. Under international marketing standards none of these products should be advertised. UK law is narrower and only advertising of infant formula is prohibited. The identical branding makes this distinction irrelevant. The Department of Health Guidance Notes on how companies, Trading Standards and other should interpret the law does have some provisions to try to stop cross promotion. For example, they suggest that the text saying the type of milk (e.g. Infant Milk, Follow-on Milk) should be at least as big as the brand name, which is clearly not the case. No prosecutions have been brought against Danone, Nestle or any other company for breaking this article of the law. Article 17 of the law prohibits text and images on infant formula labels that may idealise use of the product. This is not respected by the companies. For example, Danone uses shields (implying protection) and hearts (implying love) logos on its Aptamil and Cow & Gate brands. The letter M in the SMA logo is a stylised image of a mother feeding her baby. No prosecutions have been brought over idealising images on labels. Companies such as Danone and Nestle promote their infant formula brands widely. Often this is done through advertising for other products in the range that make the brand the focus of labels. Sometimes it is done through promotion of information services. Again, the Department of Health Guidance Notes give advice on interpreting the law and say, for example, that the brand must not be made the focus of such advertising, but that is the common strategy. Baby Milk Action has even won cases at the Advertising Standards Authority (ASA) showing that the public have been misled by such adverts. The example below from 2012 predates Nestle’s takeover of SMA. The ASA ruled that the suggestions that SMA is better than breastfeeding and better than other formulas could not be substantiated. 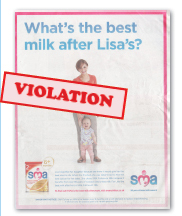 There was no prosecution for this, nor the fact the advertising promoted the SMA infant formula brand. In more recent developments, Nestle has promoted the SMA brand with street stalls. And it has partnered with parenting bloggers, who direct pregnant women and new mothers to the “SMA Mums” website for information on diet during pregnancy and breastfeeding – the website promotes the infant formula (examples here). The formula regulations are to be replaced by new EU Regulation 609/2013 on Foods for Specific Groups. Baby Milk Action briefed the European Commission on the failings with the current system and supported a campaign at the European Parliament to bring these measures into line with international standards, but few improvements have been made. In February 2016 the Department of Health (DH) conducted an informal consultation on a draft Statutory Instrument to enforce the forthcoming legislation in England. Click here for Baby Milk Action’s submission on behalf of the Baby Feeding Law Group (BFLG). BFLG brings together the main health professional and mother support groups in working to bring UK legislation into line with international standards. DH is proposing decriminalising aspects of the regulations, such as the labelling requirements. As described above, these have been systematically broken for years without any legal action being taken. DH is proposing moving to a system of Improvement Notices. This sounds similar to the current system where a Trading Standards Primary Authority liases with a company to encourage “corrective action”. As described above with the example of Tesco, there is no subsequent action when a company continues to break the law or repeats the same offense after giving assurances it will stop. When companies have been breaking the law since regulations were introduced in 1995, they do not need more time. Improvement Notices only make sense if there purpose is to protect the child’s right to health and they are intended to be a more flexible way to prompt faster action. To achieve this, they would need to be public, have deadlines attached, and be backed by criminal prosecutions if the deadline passes without the required action being taken. MPs can show their support for enforcing the law, rather than weakening it, by signing EDM 1189. If you are frustrated by companies getting away with breaking the law, please ask your MP to sign. The cost of the promotion that companies do in breach of the regulations goes onto the price of formula. If the regulations were brought into line with international standards and enforced, formula could be cheaper for those parents who use it – not promotional price cuts, but permanent lower prices. No promotion – Cheaper formula. The majority of mothers in the UK say they wanted to breastfeed for longer (90% who stopped by 6 weeks; 63% of mothers interviewed when their babies were 6 to 8 months old – National Infant Feeding Survey figures). The Lancet Breastfeeding Series published in January 2016 highlighted the UK as having the worst breastfeeding rates on the planet at 12 months of age. Articles in the series explain the poorer health outcomes when babies are not breastfed and the cost to the economy. The costs to the NHS of treating the greater incidence of illness in babies who are not breastfed has also been calculated. Details here. We know what needs to be done to enable mothers to breastfeed as long as they wish and to ensure that all mothers have access to accurate, independent information: implement the measures in the Global Strategy for Infant and Young Child Feeding. The World Breastfeeding Trends initiative is assessing the state of implementation in the UK. This includes implementing the International Code of Marketing of Breastmilk Substitutes and subsequent, relevant Resolutions of the World Health Assembly. Companies should abide by these provisions independently of government measures (Article 11.3). They do not. We need your support to continue monitoring the baby food industry and for our work to strengthen regulations and enforcement. Visit our Virtual Shop – all profits go towards our work.